Did you know that 40 million adults in the United States suffer from anxiety disorders? According to American Academy of Pain Medicine, around 30% of the adults suffer from chronic pain. And the most effective way to reduce stress and relieve your chronic pain is through massage. Massage is rising in popularity and in USA people spend more than 6 billion dollars on massage service. Because of such high demand, massage therapists are looking for the best massage table on the market. Whether you are a massage lover or a therapist, you need the best massage table at your disposal. But there are lots of massage table to choose from. To remove this confusion, we’ve created the best massage table reviews and buying. Read through the rest of the article, spend a few minutes on research and you’ll easily be able to pick the top massage table out there on the market. Among the various massage tables available on the market each one offers different features. It is important to know which feature you are looking for in a table. Below are some of the features you should consider before choosing the best portable massage table. When it comes to buying a portable massage table, durability and strength are the key features to consider. You do want to buy a product that you can use for a long time. Even if you have a high-quality massage table, it won’t serve its purpose if you’re not comfortable. Massage tables are used for relaxing and in order to truly relax you must feel at ease. Check the materials used in the construction, the size of the table, and the materials used in the cushion. You should take the material of the table into consideration. Check if it is made using PU leather or real leather or the base frame is made from Aluminum or wood. These facts are important for the table’s comfort and stability. The overall size of the massage table is important. You should pick a massage table that ranges from 28 to 30 inches. This is the ideal width for most of the people. If the table is very wide the therapist won’t be able to reach necessary parts of the back. Most of the portable massage table on this list weighs at around 30 to 40 lbs. Because these are transportable. Too lightweight means it won’t be a stable table and it’ll also make a squeaky noise. On this list of massage tables, most of them can support around 450-600 lbs. Before buying one, check what weight cables are installed on the table. Less than 300lbs load capacity is a bad choice. Look for a massage table that you can adjust the height depending on your needs. If you want to give the best possible massage experience, you should pick a table that gives the ability to adjust the height. You are investing in a table but you should also take the full advantage of your investment. A lot of manufacturers give accessories free with purchase. The table alone will not suffice. Check out for accessories such as sheets, armrests, headrests, carrying bag, and so on. There are cheap massage tables as well as massage tables that can cost thousands of dollars. The products on this list are based on value per dollar. It is through our extensive research that we picked not only the best quality but also best in value. We are not sponsored by any of these manufacturers nor are we paid to write the review of them. The only reason why we wrote this article was to remove the confusion most of the consumers go through when they are buying a massage table for the first time. To make their process easier we even went through our own method of intensive research and picked only a handful of products that deemed best. We took the size and the height of the massage table into consideration. Because of that, we knew exactly what table we should choose from the beginning. Knowing the length and width of the massage table was a crucial part of our selection process. Was it portable? Yes, we also took this fact into consideration. The tables on this list are easy to fold and store. We also checked if it has its own carrying bag. The massage table should come with a lot of included accessories. Because we wanted only the best value for the money massage table and for that we had to consider this fact. The materials of the table and the leather quality. The leather cover needs to be comfortable, oil resistant and water resistant. It helps for easier cleaning because essential oils are most used in massage therapy sessions. We also took notice of the weight capacity as mentioned above in the buying guide. Also, the fact that what and where the table will be mostly used. After all of the factors mentioned above, we have selected the top 5 best massage tables on the market. Pu Reiki Portable Massage Table by Best Massage. All of the tables on our list are top contenders for the best massage table. But we had to pick one. This table is professional grade massage table that is built for the everyday consumers. Because of its exceptional build quality and comfort, also the budget friendly price tag we picked this table as our best of the best pick. 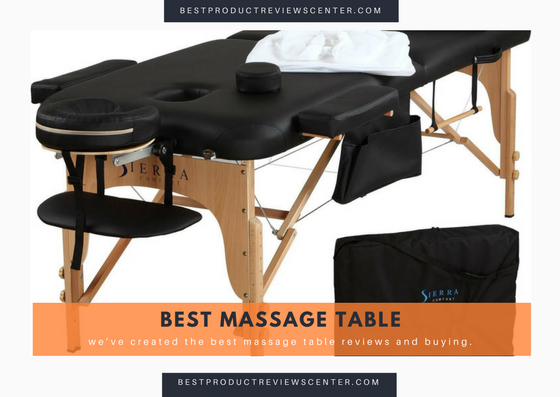 We’ll now continue with our list of the top 5 best massage table reviews on the market. The first pick for our lineup is the Sierra Comfort All-inclusive portable massage bundle. This table offers you a complete massage solution that includes just about everything you need to get started. It comes with all the accessories such as sheets, carrying bag and plenty more. With a great price tag, makes this product a complete massage solution. - In terms of construction, the base of this portable massage table is made of high-quality Hardwood Beach timber. The PU leather adds extra durability which is waterproof & oil-resistant. - The deck part is made from luxurious high-density foam with a thickness of 2.5 inches. The sheets are made using 100% cotton fitted material that keeps the client comfortable and relaxed. - It has durable stitching and coated tension wires along the leg which increases durability and protects the table. - The package also includes a wide variety of massage accessories. It comes with an oil pouch and a semi-circle bolster. There is also a towel hanger that is neatly positioned. This table is very durable and long lasting. Cleanup is easy because of the waterproof and oil-resistant leather. Very portable and disassembling is easy. This table is very comfortable as the name suggests. Although it is a minor issue the arm rests seemed a little loose. If you are looking for a highly durable and comfortable table with a price tag that won’t break your bank than Sierra Comfort All-Inclusive Portable Massage Table is a perfect choice. The Pu Reiki Portable Massage Table is one of the most popular tables from the renowned brand Best Massage. This table is popular for Reiki which is a Japanese method for reducing stress. This is an economical table that comes with a premium carrying case, a free pillow and two bolsters. - In terms of construction, the table’s base frame is made from Birch tree that gives it superior strength and durability. - The deck of this table is made from high-density small cell foam with the thickness of 2 inches. It has Pu leather construction which is water and oil proof. - This table has a capacity of 450lb and the height is also adjustable between 26 inches to 36 inches. - The accessories include a free pillow, a premium carrying case and two free bolster pillows. It has a removable cushion for head rest. -This table has great portability; you can easily fold it and unfold it. Makes it easy to move around the house and save space. Low priced table with no compromise in quality. Durable table with good comfort. Pu leather makes it easy to clean up afterward. The table is height adjustable and good weight capacity. This is a lightweight product and makes a creaking noise when someone heavy is on it. If you are someone new who is just starting out in massage field than Pu Reiki Portable Massage Table by Best Massage is a good deal for the price. The quality of this table will make sure it will last long. The Earthlite Harmony DX is a professional grade portable massage table, which is made by the world’s most trusted brand in massage that offers a complete solution for massaging with its all-inclusive packages. This model is designed for the professionals and gives ultimate comfort to the client who uses it. - In terms of quality, this table is made from hardwood maple tree, the deck is made from aircraft grade Russian plywood which gives it superior strength and the weight capacity of 600lbs. - In terms of comfort, it is as comfortable as massage table can be. The face cradle is made from Cloudfill poly-gel blend, soft dual density cushioning, and the Natursoft™ fabric takes the comfort to whole new level. - In terms of durability, the full-length piano hinge increases its overall strength, sure-grip knobs and non-slip Stablefeet™ makes it one of the best durable massage tables out there. - This table gives you the assurance of worry free quality usage for years because the manufacturers give lifetime limited warranty on construction and frame. The foam and upholstery also come with 3-year warranty. - It is easily foldable and comes with a premium quality nylon carrying case. The table weighs only 34lbs. It has adjustable face cradle and cushion is very comfortable. Premium quality massage table for professional use. This table is packed with professional quality features and virtually squeaks proof. It has a sleek and professional design. The only slight issue is, it doesn’t include a lot of accessories as the other tables on this list. If you are looking for a professional quality massage table with in a decent price range than EARTHLITE Harmony DX Portable Massage Table in the only table you’ll need. This is the only non-massage table review in this list. Therapist’s Choice® DELUXE Massage Table Fleece Pad Set is for those who already own a massage table. This pad set is very popular because of the super comfortable experience. - This pad set is designed to go over the table and provides a more comfortable experience to your client. The cradle is made 100% polyester synthetic cover. - The fitted cover fully wraps the table on each side ensuring a perfect fit. This pad adds an extra layer of comfort to your table. - It fits most of the tables and has a natural color. The corners are secured by an elastic strap which ensures the pad doesn't slip off. - The high-density low pile design keeps your client warm in the winter. It is luxuriously soft and hypo-allergenic which also keeps your client cool in the summer. - It also extends the life of your table’s corner and tops by giving it an extra layer of protection. This pad keeps your client comfy. Extends the durability of your tables. It also holds up well in the wash. Some of the consumers felt that it wasn’t thick enough. Therapist’s Choice® DELUXE Massage Table Fleece Pad Set is without a doubt a great table cover for the cost. Gives your table extra level of comfort for your clients. The Merax Aluminum 3-Section Portable Massage Table has an aluminum build which has a total of 3 sections. The aluminum frame and comfortable cushioning make it a popular choice for beginner therapists and massage lovers. - In terms of durability, this table has a sturdy aluminum frame and well-crafted table base. It has a weight capacity of 500lbs which means it can hold a wide variety of clients. - This table is very comfortable due to its thick padding. It has high-density foam which has 2inches of thickness. The height can also be adjusted from 26’’ to 36’’. The package comes with a lot of accessories. - The table has great flexibility. The head angle can be tilted for more comfort. The backrest can also be adjusted to a sitting position. This table meets the various positions for different therapies. - The cover surface of this table is made from synthetic leather. They are soft and durable. Because of the aluminum frame, it weighs a lot less than other paddles and at the same time provides good stability. - Setting it up was easy because no tools were required when setting up this massage table. - For the comfort and easy maintenance, the cover surface is made from a material that is super soft, durable and easy to clean. This table offers good stability. Easy to assemble, maintain and cleanup. This table can be used as a tattoo bed or a spa bed. It is ideal for salon use and other therapeutic purposes. To be honest, this isn’t the most comfortable massage table out there but it is quite satisfactory. This is a model that has a good build quality and offers a lot of free accessories. With its cheap price tag, The Merax Aluminum 3 Section Portable Folding Massage Table is well worth the money. - Properly maintain the correct care for your massage table and it’ll last a long time. - Choose the most appropriate type of foam cushioning for your table. - Check for warranty of the table, so that you can return the product if you get a faulty package. - Make sure the leather is both waterproof and oil resistant as this will help the surface to stay in the best condition. Always check the consumer review before purchasing any massage table. In this article, we’ve featured the top 5 folding portable massage table reviews and buying guide. We hope that this was a great place for you to start when it comes to choosing the best massage table for your needs. Let a comment below and let us know which one you picked.